Carol Elizabeth Hoffman was born on 20 September 1918 in New York. Christian Hoffman appeared in the US federal census of 1 January 1920 in Buffalo, Erie County, New York, at 756 Glenwood Avenue. Other members of the household included Carol Elizabeth Hoffman, Ruth Mary Hoffman, Esther Louise Hoffman, Christian Charles Hoffman, Edith Dorothy Hoffman and George Daniel Hoffman. Christian Hoffman and Anna Maria Christina Borth appeared in the US federal census of 1 April 1930 in Buffalo, New York, at 756 Glenwood Avenue. Other members of the household included Carol Elizabeth Hoffman, Ruth Mary Hoffman, Esther Louise Hoffman, Christian Charles Hoffman, Edith Dorothy Hoffman and George Daniel Hoffman. 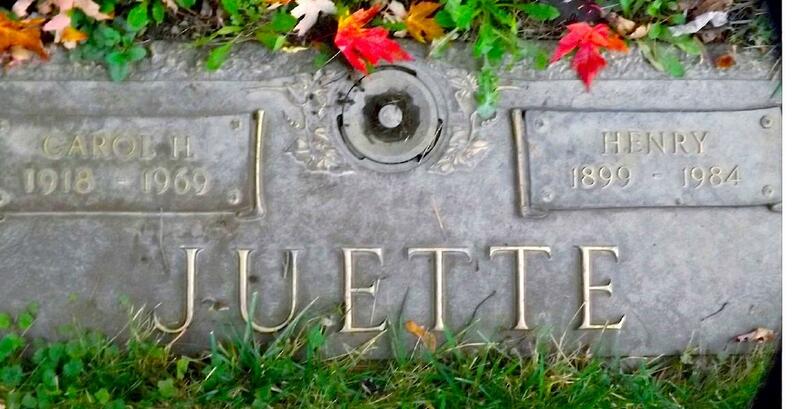 She married Henry Juette, son of (?) Juette and Unknown (? ), on 27 July 1946 in Buffalo, Erie County, New York, at Concordia Lutheran Church, with Rev. Herbert A. Bosch officiating. The following appeared on 2 August 1946 in the Buffalo Courier-Express: Mr. and Mrs. Christian Hoffman of Glenwood Ave. announce the marriage of their daughter, Carol Elizabeth, to Henry Juette of Winspear Ave. on Saturday, July 27th, at Concordia Lutheran Church, in the presence of the immediate families. The Rev. Herbert A. Bosch officiated. [:CRT:] Following a reception at the home of the bride's parents, the couple left for an Eastern motor trip. After August 15th, the newlyweds will be at home at 114 Winspear Ave.
Carol Elizabeth Hoffman died on 6 July 1969 at age 50 in Eggertsville, Erie County, New York, at 4100 Main Street at her residence. Henry Juette became a widower at her death. The following appeared on 8 July 1969 in the Buffalo Courier-Express: [Died] Carol E Hoffman Juette, July 6, 1969, at her home at 4100 Main St., Eggertsville, N.Y. after a long illness, beloved wife of Henry; mother of Paul H; daughter of Christian and the late Anna Mary Hoffman; sister of Ruth M. Hoffman, Mrs. Alfred (Esther) Schillke, Christian C. Hoffman, Mrs. Carl (Edith) Eyring of Phoenix, Ariz. and George Daniel Hoffman. Friends may call at the Darwin E. Myers Funeral Home Inc., 4614 Main St., at Roycroft Blvd., Snyder, N.Y., Monday 7-9. Funeral from St. Paul's Lutheran Church, Wednesday at 2 o'clock. Friends invited. Memorial contributions may be made to St. Paul's Lutheran Church.